We need to live life to the full and so do our feet! Happy Socks believe this too. Founded in 2008, this Swedish fashion retailer specialise in, yep you guessed it, socks! 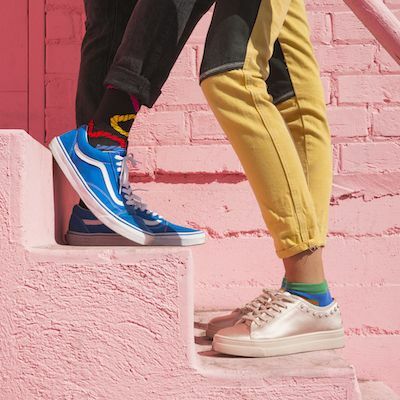 Selling novelty, wacky socks to both men and women in more than 90 countries, the creators of Happy Socks had a vision: to turn an everyday piece of clothing into something creative, resulting in their company being formed. We feel like the bee’s knees when we get a pair of fabulous socks from Happy Socks! Browse through their immense amount of products with countless models and designs, featuring a rainbow of colours and unique patterns. It’s not just socks! Happy Socks provide an abundance of underwear too. Go onto their website and search for the perfect piece of clothing by filtering down to the colour you want. From Zebra socks to Seasonal socks, Ladybug socks to Checkered Stripe socks, get whatever you want for great deals! Here is the page to see all the latest student discount codes from Happy Socks. Just sign up for FREE to gain instant access to the best Happy Socks youth vouchers and offers. Exclusively for students, apprentices and those aged 16-26.